Waterproof Eyeliner Pen with a felt tip for precise lining of the eyes to create that perfect cat eye. The felt tip is long and sharp, to allow for gentle strokes to easily build up the line, without making a mess. This product is also waterproof, which allows it to last all day without smudging. When I first bought the product it wasn't to bad easy to use. But sadly it dried out extremely fast and was unable to use it again . Waterproof but not long enough breath!!! I so sad to have to admit that there is an Essence product that I might not repurchase again (sad face). And in my own defense I did buy all the liquid pen eyeliners Essence had on the shelf. The product itself is not bad at all (when it works), but I found it to not last that long, After a few uses it just don't give that black ink look it did in the beginning. 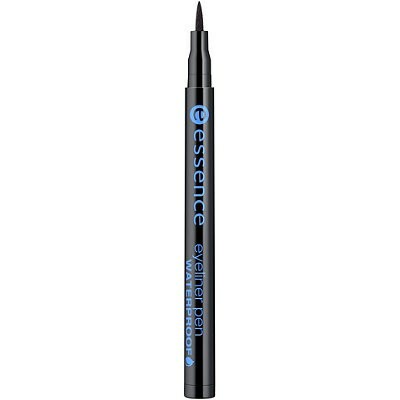 The tip is super amazing and thin and gives for amazing winged liner application but it the product inside tend to let down. I kept the pencil and now dip it into a bottle of liquid eyeliner that I have cause the tip is soooo great! Just wish the ink lasted!